Because the angels are, in fact, STILL singing and because some of us need a messenger of the Lord right here, right now, I wanted to highlight this portion of the Rhoades Family Christmas card from 2010. 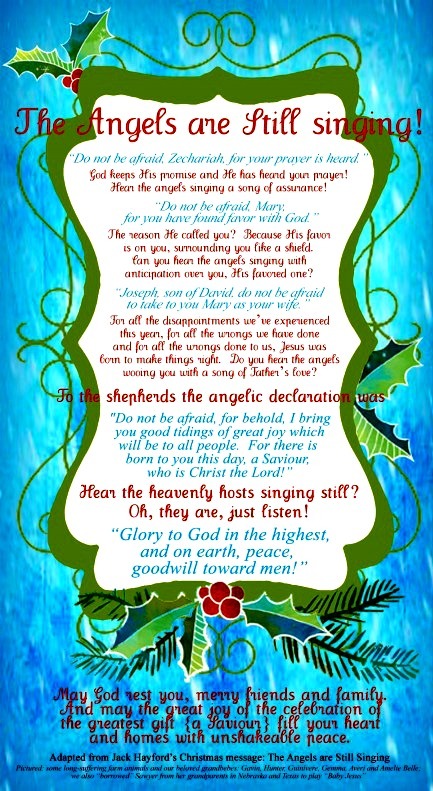 Because the angels that sang and rejoiced in the sky pronouncing PEACE & GOODWILL on the night Jesus Christ was born are the same angels who now attend to the household of faith! REJOICE, friends and familia! The angels of the Lord are near. Listen for the song – it’ll be good news for sure. Now please go back and notice how many times the angels said: Fear not (do not be afraid)! Thank-you, Jack Hayford, for preaching Christmas up year after year!